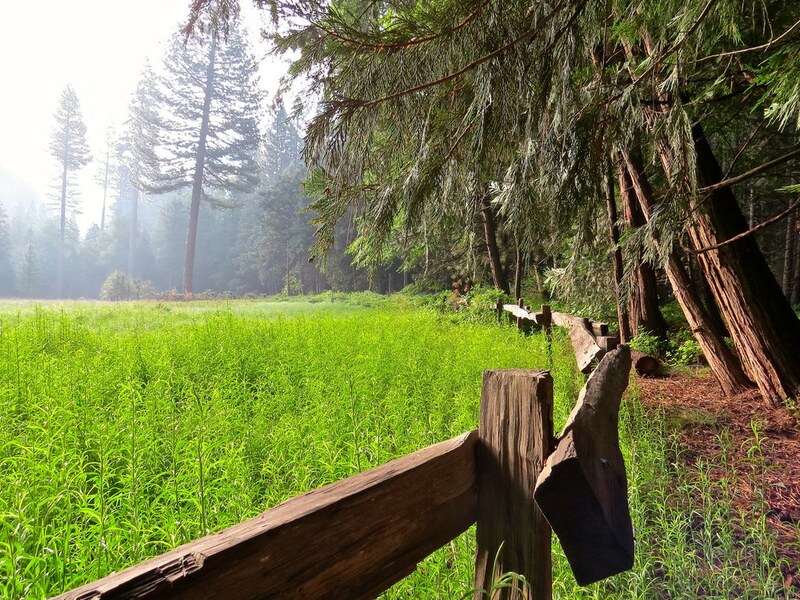 Buckeye Flat is a quiet campground near Hospital Rock in Sequoia with 28 sites for tents only. It’s open from late March to late September, and reservations are accepted from late March through the September closing. Buckeye Flat is one of the lowest campgrounds in the park, so don’t expect giant sequoia trees, and do expect it to be very warm in summer. Atwell Mill, located halfway up Mineral King Road in Sequoia National Park at 6,500 feet, is open from late May to late October. Many of its 21 sites (tents only) can be reserved during the busy season, May through September. The highest campground (7,500 feet) in either park, Cold Springs is in the heart of Sequoia’s Mineral King Area. Its 40 sites (tents only) are available from late May to late October, first-come, first-served. Lodgepole is probably what you’re picturing when you picture camping in Sequoia National Park. It’s in the heart of the park amid pines and giant sequoias and near the Marble Fork of the Kaweah River, and it’s also close to a visitor center and store. The campground is open from late March to late October. Many of its 214 sites can be reserved during the busy season, late May to late October, through recreation.gov. Another beautifully shaded campground in the heart of Sequoia National Park 10 miles from Giant Forest, Dorst Creek has 281 sites and is open from mid-June to mid-September. Sunset is the first campground you come to when you enter Kings Canyon National Park from the west or the south. It has 157 evergreen-shaded sites, all available first-come, first-served, and open from late May to early September. Like the other Grant Grove campgrounds, Sunset is convenient to the store and visitor center in Grant Grove Village. The second campground for visitors approaching Kings Canyon National Park from the west or the south, Azalea has 110 first-come, first-served sites. Like the other Grant Grove campgrounds, it’s convenient to the Grant Grove Village store and visitor center. Azalea is the only campground in Kings Canyon National Park that remains open year-round. Crystal Springs is neatly situated between the General Grant Tree and Panoramic Point, about a half mile from Grant Grove Village. It has 36 first-come, first-served sites, open from early July to early September. Out near the end of the Kings Canyon Scenic Byway (State Route 180) is this closely spaced trio of campgrounds along the South Fork of the Kings River. The campgrounds have 82, 111, and 120 sites, respectively, all first-come first-served. The scenic byway that reaches the campgrounds is open only from about mid-April to mid-November. Sentinel Campground is open during that period; the other two campgrounds open a bit later in the season and close a bit earlier. Sequoia and Kings Canyon National Parks are unusual. They not only abut one another, but as you drive through them, you are also likely to pass through portions of Sequoia National Forest and Giant Sequoia National Monument, which both have campgrounds operated by the US Forest Service. You’ll find five Forest Service campgrounds in the Hume Lake area, which borders on Kings Canyon National Park. All of them can accommodate at least small RVs, and the three larger campgrounds have sites that can be reserved through recreation.gov. The campgrounds are generally open from mid-May to mid-September. Princess Campground, west of Hume Lake on Kings Canyon Scenic Byway, has 88 sites, and is the most accessible. Convict Flat is farther east on the scenic byway, and has five first-come, first-served sites. Hume Lake has 74 sites near the shore of the lake. Landslide and Tenmile are south of Hume Lake. Landslide has nine first-come, first served sites. Tenmile has 13 sites that can be reserved through recreation.gov. These Forest Service campgrounds lie right in between Sequoia and Kings Canyon National Parks. Stony Creek (49 sites) and Upper Stony Creek (18 sites) are just off Generals Highway and are open from late May to late September. Both accept reservations through recreation.gov. Horse Camp (five sites), Buck Rock (11 sites), and Big Meadows (40 sites) are farther north, i.e., closer to Kings Canyon. They’re off Generals Highway, a few miles down Big Meadows Road (Forest Route 14S11). They close with snow, and open with snowmelt. All three are first-come, first-served. As you plan your trip to Sequoia and Kings Canyon National Parks, don’t forget the most useful resource you can bring along—the Just Ahead app loaded with our Sequoia and Kings Canyon tour. 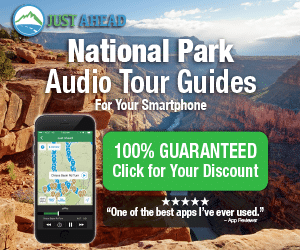 Just Ahead turns your smartphone into an audio tour guide that will guide you to the park and all of its best landmarks, hikes, viewpoints, and side trips. It’s the best way to get the most from your visit. Click here to try Just Ahead for free. National Geographic Adventure and Outside magazine author Bob Howells is also co-author of National Geographic’s Secrets of the National Parks.